At a time when Americans owe close to $800 billion in credit card debt, the myth is that credit cards are primarily financing America’s luxury lifestyles—helping white suburban families pay the costs attached to extravagant homes, luxury cars, and golf club memberships—or helping those who aspire to these lifestyles. Up to Our Eyeballs reveals the disturbing reality that credit cards are in fact the new “safety net,” being used by desperate middle- and low-income families to manage essential expenses. In the increasingly volatile American economy, where a decline in work-related benefits like health insurance and pensions has accompanied a rising cost of living and increased job instability, consumer debt has become a fact of life for many American families. 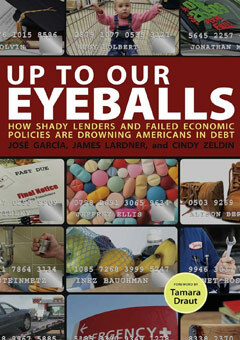 Up to Our Eyeballs is a troubling examination of the causes and consequences of this explosive rise in consumer debt. Including a critical look at how the financial industry became the aggressive, hyper-profitable industry it is today, this book also incorporates solutions that will be of real relief to struggling households.